Many of my students have heard some of my more stressful airport stories. My wife, of course, has heard them all! Some of them were just unavoidable. However, we can eliminate a lot of the stress that seems to go with us when we travel. Darrin Zeer offers some wonderful tips for letting go and creating a sense of calm in his book, Travel Yoga (Chronicle Books; San Francisco; 2005). He offers an excellent tip for finding serenity while standing in line during a long wait (p. 42; a slightly different pose than the one pictured on the cover). Standing on your left foot only, cross right foot over left. Right toes should not touch the ground. (BLOG Editor's note: Make sure that you unlock your left knee slightly for better balance control. Put your hands on your waist and focus your gaze on a spot a few feet in front of you. Feel the sole of your left foot rooted into the floor, balance on your left leg, and feel your posture rise upward. Take five deep breaths while focusing on being patient, and then switch legs. This quote provides one of the simplest ways to relieve stress: PRIORITIZE! Doing what is necessary first lifts a lot of worry off of the head, neck, and shoulders (masseters, hips, and anyplace else you carry your stress). Please also check out Darrin's excellent and quite funny BLOG. "Some men see things as they are and say why. I dream things that never were and say, Why not?" IS EHINACHEA AN EFFECTIVE COLD REMEDY? Placebo effect or actual remedy? 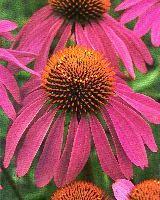 Many people swear by Echinacea for reducing the effects and shortening the duration of their cold symptoms. The multitude of research studies on Echinachea reveal conflicting results. A new study published in The New England Journal of Medicine (July 28, 2005; number 4; Volume 353:341-348) reports, "no statistically significant effects . . .
on rates of infection or severity of symptoms. Similarly, there were no significant effects of treatment on the volume of nasal secretions, on polymorphonuclear leukocyte or interleukin-8 concentrations in nasal lavage specimens, or on quantitative-virus titer." The authors' conclusions: save your money. "The trouble with the rat-race is that even when you win you're still a rat"
More than one billion of the world's population lives without electricity and phone service, according to Ephraim Schwartz (InfoWorld; July 25, 2005; p. 8). He reports that the nonprofit group, Inveneo, brings VoIP, e-mail, and Web browsing to remote African villages through decidedly low-tech means: bicycle-powered Wi-Fi networking. The bicycle supplements a solar-powered system, and the arrangement affords riders one hour of telephone talk-time for every 15 minutes spent pedaling the bike. Schwartz also sees an economic structure developing around this technology, providing potential jobs to villagers who might earn money pedaling for those who want to use the phone but don't "want to work so hard." The system provides obvious health benefits to those willing bikers, while the village fat cats just keep getting fatter. Apparently, some things don't change no matter where one travels in the world. High-tech companies such as Cisco provide the hardware, banking on the idea that they can create more than a billion new consumers as more people connect to the Web. Schwartz quotes estimates "that in 10 years, the combined populations of what we call developing nations will make up 70 percent of the consumers in the world." And so goes the simple life, for better or for worse, as remote villagers trade in their time and energy for exposure to products they never knew they needed (as well as some things they certainly need desperately), as they now also enter the 21st century. Thanks to Inveneo and InfoWorld for the images borrowed from their websites for this article. Oak Tree PT provides Physical Therapy treatment and services. We also provide cutting-edge seminars for Physical Therapists, Occupational Therapists, MDs, Nurses, etc. Those practitioners take our courses because they want fresh approaches, new tools, and effective treatments (hence, our slogan). While "breaking out of the box" that contains the same old stuff they've been doing for years (some of it still very effective, I should add), therapists earn Continuing Education credits by participating in our classes. View our course calendar and descriptions of all of our current seminars (and enroll in a class). I would like to invite comments, input, and feedback on our slogan. I think that it represents us well, but I am wondering if it should be more concise in order to be an effective slogan. I welcome all suggestions. Our slogan: "Fresh approches, new tools, effective treatments"